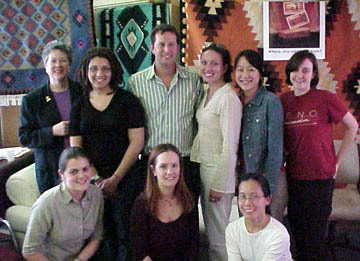 A Group meeting of the AP interns with Maria Carland from Georgetown University (top left) and Jeff Bernstein of the One Small Step Foundation. Early in 2003, the Advocacy Project decided to extend the package of support it offers to partners, by including an internship program. AP approached several partners and asked whether they would be interested in hosting an intern for the summer months of 2003. AP received inquiries from over twenty graduate students. Almost all came from Georgetown, although we also heard from two students at Yale and Columbia University, who were interested in working in Nigeria and Bosnia, respectively. for non-profits, or in the Peace Corps, before returning to university. AP’s Coordinator teaches at Georgetown and AP has also co-sponsored a series of human rights events with Georgetown’s Institute for the Study of International Migration (ISIM). AP staff then spent a month putting prospective interns in touch with partner organizations, based on the preference of the intern and the needs of the partner. We selected eight students, all of whom had a commitment to building civil society and had impressive work experience. In addition, AP was able to secure several computers from the Mott foundation, for use by the partner organizations. These would be delivered by the intern. It was left to each intern to secure funding, although AP agreed to ensure that every intern had a minimum of $2,500 to cover expenses. AP would like to acknowledge the generous support of Omar Kader, Chief Executive of Pal-Tech, who subsidized the internship of Caitlin Williams with MEND, in Israel. Two of AP’s interns were able to secure support from the One Small Step Foundation. Georgetown University also provided support for four other interns. Where possible, host organizations were asked to cover local living expenses. Prior to their departure, AP staff held a training session with all of the interns at the AP office in Washington. Part of the session was attended by Jeff Bernstein, founder of the One Small Step Foundation, and Maria Carland, Deputy Administrator of the Masters program at Georgetown’s School of Foreign Service. We express our appreciation and thanks to them both for their encouragement and support. AP hoped to make the internship program as rich as possible, for the students and for their hosts. With this in mind, AP asked the interns to post regular diary entries, or blogs, directly onto the AP site. AP’s technical team of Teresa Crawford and Ginger Bazar provided training for the interns and also adapted the AP site accordingly. Our intention was to provide readers with a personal account of the interns’ experience (and also encourage our interns not to leave their written reports until the last minute!). This was the first time any international internship program had employed blogs in this way and the experiment was written up in Wired.Com. Visits to the AP website doubled on the day the article was published.